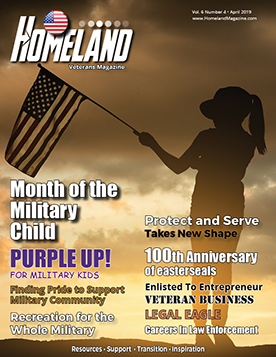 For the “Dog Days of Summer” edition in August, Homeland Magazine profiled San Diego Artist Ruben Chato Hinojosa Jr. in a short article. The focus of the article was about an original painting he created called, “The Brotherhood” which captured the bond service dogs have with their handlers. This month for the transition edition we want to expand on Ruben’s talents and talk about his transition from the U.S. Navy and what advice he gives to other artists leaving active duty. Being an artist is in Ruben’s DNA – his grandfather and father were both artists. In fact when Ruben was a child, his grandfather gave him his first set of paintbrushes. His grandfather, Neto, was his role model as he was growing up and the lessons he learned from his grandfather some 50 years ago still stick with him today. His grandfather taught him American Indian traditions and also how to be humble and help people. One of Ruben’s favorite quotes is, “Be a peaceful warrior in the path of life but be a fierce warrior in the path of fight” and his grandfather was the inspiration for that. When Ruben joined the Navy in 1988, his grandfather told him to “be a warrior” and that is exactly what he did. Ruben draws much of his creative inspiration from his heritage including the first of his four series of significant times in his life. His first series is the “Nalwodi” series which in his Apache language means strength or power. You will find many eagles in this series including his first eagle painting called, “Eagle Vision” which reflects a young eagle maturing to an adult eagle. He painted it in 2000 as an art student and in 2020 when it is 20 years old he will sell it as he looks to the future of his family. Layer One – The Warrior. Petty Officer Hinojosa spent the majority of his career with the special warfare community, first as a Navy SEAL candidate at BUDS and then as an Enlisted Surface Warfare Specialist doing missions and operating around the world. Even though Ruben did not finish the SEAL training due to an injury he sustained, he channeled his love for the water and for serving his country through a U.S. Navy Special Boat unit known as Naval Special Warfare Combatant Crewmen. Ruben spent 10 years on active duty operating high performance boats until he was medically discharged. During his time in the special warfare community, he developed bonds and friendships unlike any other. He continues to stay connected with his brothers by volunteering as the Director of Public Relations for the Combatant Craft Crewman Association (CCCA) and by painting one-of-a kind gifts for retiring members. To give back to his brothers, he donates proceeds of his military art to the CCCA so they can continue to help support their community. Layer Two – The Sculptor. The eagle sculptures that sit on his counter in his studio are for the upcoming San Diego International Film Festival Arts awards. The Golden Eagle awards are for the “best of” categories including film, director and actor. He hand sculpted them, hand paints each and every one of the 24 eagles for the awards. In previous years, winners of these awards were internationally-recognized actors, so we can say that his work is displayed all over the world. When organizations commission the Artist Chato to do unique creative works of art or he designs art for a charitable cause, he draws the inspiration for each piece through nature, wildlife and the power of the universe. When he was in college his sculptures won several first place awards in competitions and exhibitions. Layer Three – The Actor. You may have seen the actor in television and film. He has been a member of the Screen Actors Guild since 2001. His favorite acting jobs were “The Invisible Man” where he fought against himself and his favorite film was “Sierra Nevada Gunfight”. Layer Four – The Painter. On September 26, 2018 a collection of Ruben’s creations was unveiled at the California State Capitol for the celebration of Native American Day. The day is to honor the tribal men and women from California who served in the Armed Forces. The artistic masterpiece is constructed of three wood panels and there are hundreds of details in this painting. There’s the American Flag, California State Flag, a bald eagle that touches all three panels and service medals – the Purple Heart, World War I, World War II, Korea, Vietnam, Iraq, and Southwest Asia medal which was the last service medal awarded during wartime. All five branches of the military are represented. The most striking part of the painting is how he captured the American Indian traditions of youths becoming adults with a boy gourd dancing before joining the military and a young Indian girl in her regalia while proudly carrying a basket on her head. The painting will be on exhibit at the capitol before it tours to several universities and makes it last stop at the Rincon Indian Reservation. Layer Five – The Writer. It has taken 18 years to create and it is almost complete. It is his first novel, an action/adventure novel about two American Indian youths who become superheroes. Not like Batman or Superman but as Special Forces brothers who return after losing their lives in war. The novel will be grounded in camaraderie, diversity, brotherhood and sisterhood (there’s a female character too!) and in the end, man’s best friend saves the day. 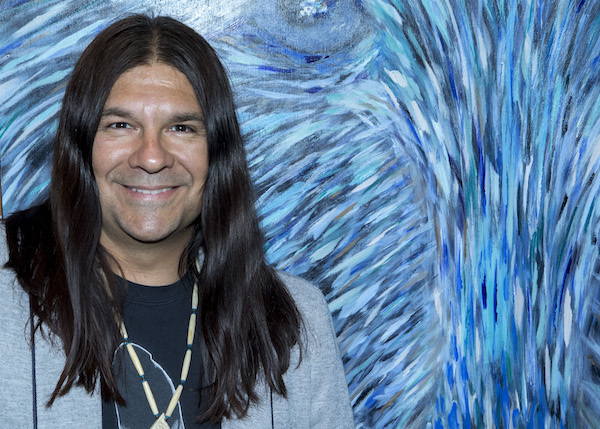 His inspiration in writing this novel came from the growing up as an American Indian and wanting to give today’s youth a superhero of their own. He hopes for this literary work to be published later this year. Layer Six – The Donor. “You have one shot at life; how will you be remembered?” says Ruben. Ruben would like to be remembered for his passion, creative soul, his humility, and most of all for his giving heart. This accomplished artist gives back to his community in so many ways. His most recent donation is to the San Dieguito American Legion – Post 416. Ruben designed a special, unique painting to be auctioned in order to raise money to help the Legion build a new Veterans Center. The Legion was established in WWI and continues to serve our active duty, veterans and their families. Their current building is deteriorating and without a physical location to provide services, they are not able to service the North County military population. Over the past few years, Ruben has donated his amazing works of art to San Diego Humane Society, Alzheimer’s Foundation, Autism Foundation, Make-A-Wish Foundation and so many more. In the past five years the Artist Chato has created paintings and sculptures for charitable causes and donated close to $40,000 of appraised pieces. That’s how he will be remembered, for being altruistic and showing the world how he loved life and existed. There are many layers to this Warrior Artist. For him, art is his life, it is healing, keeps him grounded and gets him excited about he is going to create next. His work is reflected in the four directions of Mother Earth to provide him four series of art. The first two series have been about strength and happiness – he is looking forward to finding the last two series in the pages of his life. All of these layers led to his transition from warrior to accomplished artist. Ruben would find great pride in helping today’s active duty transition to civilian life. His biggest pieces of advice are to find a mentor, surround yourself with inspirational people and find something that you love to do. Leaving the military whether it is two, twelve or twenty years is hard. Most young service men and women join straight out of high school and the military is the only life they know. Every day there is structure, routine, camaraderie with your military family and security for life’s essential needs. When you leave the military this is gone and some members find themselves in dark places – all the more reason to involved and surround yourself with people who support you. He says, “You are the happiness” and you have to create your own. For the artists, he has a few pieces of advice – do your research on patents, non-disclosure agreements, hire a business attorney for contracts and most importantly, surround yourself with people you trust. To learn more about Ruben and his artistic talents or to request a donation for an upcoming fundraiser, go to: www.chato.com.